Astrology: it works whether you like it or not. There's no obvious romantic excitement in the sky this weekend. Sure, Venus is still in impulsive Aries, Mars is in dramatic Leo, and Jupiter is in dreamy Pisces, but it's all just sort of lying there waiting for someone to do something with it. Fortunately the Moon is in Virgo for most of Saturday and Sunday. Virgo doesn't have the same reputation for sexiness that the previously-mentioned signs do... but in it's own modest (and calculating) way, Virgo actually beats them in the Naughtiness Department. It will take a bit of thinking to get that ball rolling, but remember... romance is both an Art and a Science. So if your need for love is aching... get calculating! Hi again. For those of you who have missed it, my new stuff has moved HERE... Astrologydating.com. So, drop and have a look... and should you be searching for a soulmate, membership at the site is still free. My Book, Available On Amazon.com! Meet Astro-Monkey, the Simian who sees the future! Get the bunnyhero monkey widget and many other great free widgets at Widgetbox! 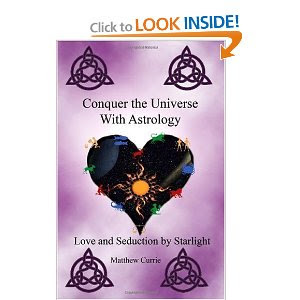 Conquer The Universe With Astrology.... The Show! Proud to be a friend of Astroamerica.com! Better books make better astrologers! I am the author of "Conquer The Universe With Astrology," which is available now HERE or (e-book) HERE. I also write a regular blog for Astrologydating.com, and occasionally show up here. Like everyone else, I am on Twitter, as "MatthewCurrie." And I'm on Facebook. Have a look around at the stuff I have here. Among other things, you'll find my Compatibility Guides for each sign, a description of what an astrologer can do for you, and a few tidbits of humour amongst the cosmic wisdom. And if you have any questions, please send 'em... you just might get answers. A Lunar Eclipse, Star Wars Astrology, The Astrology Of Stars At War, And More! Your November-December 2013 Mars Forecast! A Surprise Sale On Astrology Readings!